Let cookie dough, cream cheese and eggs stand at room temperature 30 minutes to soften. Meanwhile, heat oven to 350°F. Line 11x7-inch pan with cooking parchment paper. Crumble cookie dough into large bowl. Add cream cheese, eggs and hazelnut spread. With whisk or rubber spatula, mix until well combined, no lumps remain and batter is smooth and creamy. Pour into pan. Bake 30 minutes or until toothpick inserted in center comes out clean. Cool cake completely on cooling rack, about 45 minutes. When cake is cool, spread frosting all top. 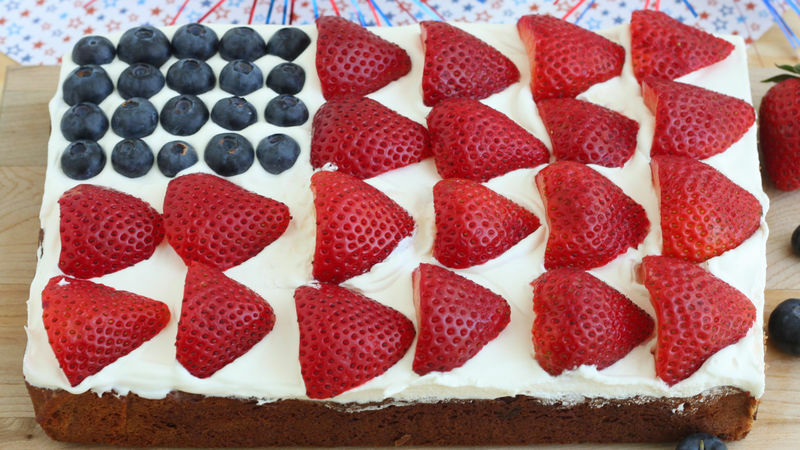 Decorate with the fresh berries to resemble flag. Refrigerate cake at least 1 hour before serving. Store in refrigerator. Allowing the cookie dough and cream cheese to reach room temperature assures there will be no lumps in the cake batter. This cake can be made year-round with any fresh fruit.